Sunny, mild with a light SW wind. A first visit for three days after two days of much rain. Two Slavonian Grebes appeared close inshore towards midday. There were also three Great Crested Grebes and a redhead Red-breasted Merganser offshore and three drakes and a duck mergansers flew west. 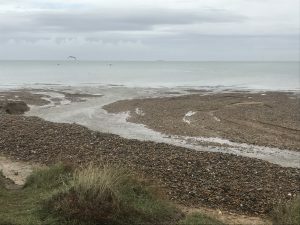 There were 56 Brent Geese on the beach, including at least seven juveniles, but no sign of Chris Gibbard’s Pale-bellied bird seen from the Tankerton slopes the previous afternoon. Waders included a flock of 40 Golden Plovers flying west offshore, one Grey Plover and three Sanderlings on the Hampton flats and three Lapwings on the Marsh Pool. A Little Grebe was in Coot Strait, a superb male Sparrowhawk was in trees by the middle brook and a female Blackcap, the first since October, was along the east bank. However, the bird of the day was a Firecrest, seen briefly in an ivy-covered tree along the upper brook, which was, inconceivably, our first for eight years! An early afternoon visit by Arnie in cloudy conditions threatening rain. An immature Shag flew east stopping briefly on the sea. Cloudy, light NE wind, steady rain. Andy and I were optimistic that the forecast for, at worst, intermittent rain would prove to be the case. However, that was not. The few birds we did see included one Red-throated Diver flying east, a Little Egret and a Grey Heron on the beach, five Brent Geese flying west and 12 Mallard in the brook. Waders included a Grey Plover on the beach and three Lapwings on the Marsh Pool. 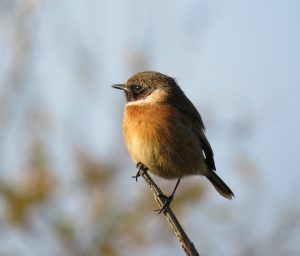 The pair of Stonechats were in the scrub and a flock of ten Linnets were in the area. Cloudy with a light easterly wind. 12 Red-throated Divers, two Gannets and three Common Scoters flew east. Two Teal and two redhead Red-breasted Mergansers were on the tidal ponds whilst a flock of 14 Brent Geese on the beach included four juveniles. Two Water Rails in the brook by the scout hut were new for the year and our first multiple sighting. 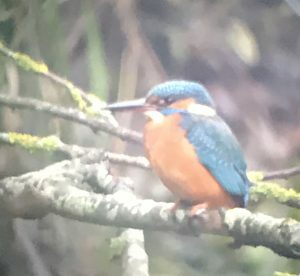 As they scuttled across the brook, one after the other, a Kingfisher splashed into the water beside them (an attempt at digiscoping below). Cloudy and calm. A redhead Goosander circled over the Marsh Pool before landing on the sea close inshore where it remained for some time before flying off east over the caravan park. Another addition to the year list. Our third record of Little Grebe was, like the other two, along Coot Strait. Five Wigeon and seven Pintail flew west together and seven Teal also flew west. An adult drake and a duck Eider were offshore. 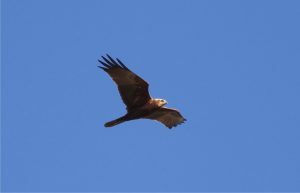 A juvenile Marsh Harrier flew high west over the area and then drifted back east. Cloudy with a light SE wind. A Red-throated Diver flew west, a Great Northern Diver flew east close inshore and a Black-throated Diver, close inshore, flew off east. Two female Eiders were on the sea. An adult Mediterranean Gull landed on the sea off the Obs. Cloudy, cold, fresh easterly wind with a few showers. A good variety of wildfowl with a single adult White-fronted Goose flying east close inshore and the a flock of c35 coming in off the sea and heading SE, and two Goldeneye flying east (an adult drake followed later by a redhead) both additions to the year list. Other ducks included a party of seven Gadwall flying east, a Tufted Duck flying with a flock of Wigeon, 12 Eider flying west and six Red-breasted Mergansers flying east. Also, two Great Skuas, an adult Little Gull and a Razorbill flew east. Sunny and cold with a moderate easterly wind. Andy braved the Sunday dog worshippers and was rewarded with a Grey Phalarope, which flew east close inshore at 8.35 am, occasionally touching down on the sea. New for the year and only our fourth record here! Also noted were 18 Red-throated Divers and four Eiders east and eight Teal, 24 Common Scoters, three Great Skuas and eight Razorbills west. Two Red-breasted Mergansers were on the sea. Sunny and cold with a light SE wind. The cold weather encouraged a significant movement over the sea although the winds were light. There were two Slavonian Grebes on the sea, c50 Gannets were feeding distantly offshore, 24 Red-throated Divers, c50 Common Scoters flew east with five Velvet Scoters and two Shovelers accompanied them. One Black-throated Diver, the immature drake Eider and two redhead Red-breasted Mergansers were offshore and 120 Brent Geese, two Shelducks, five Teal and ten Little Gulls flew west. One Great Skua was also seen offshore. Three Kittiwakes flew east and c100 large auks, the majority identified being our first Razorbills of the year, also flew east. Away from the sea, the distinctive calls of a Ring-necked Parakeet were heard from the estate (another addition to the year list). 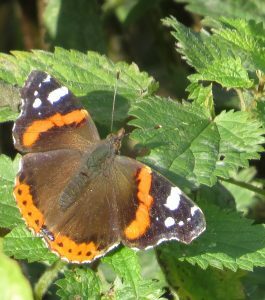 Despite the cold, the sun encouraged a late Red Admiral on the wing. Cloudy, murky, calm with a constant drizzle. A Great Northern Diver was offshore. A pair of Wigeon with three Teal were on the tidal ponds and another seven Teal flew west. Two Shelduck flew west, three Gadwall were on the sea, flocks of five and 25 Pochard flew east and there were now two immature drake Eiders on the sea. An unprecedented flock of 288 Dunlin were feeding on the Hampton flats. Two Grey Plovers were on the beach, a party of five Knot flew west and a Bar-tailed Godwit flew west then east along the beach. Two Lapwings and a Snipe were on the Marsh Pool. Cloudy, mild with a light southerly wind. Singles of Red-throated, Black-throated and Great Northern Divers were present offshore. The immature drake Eider was also, with 16 Common Scoters flying east and four Red-breasted Mergansers flying west. 14 Lapwings flew west and a party of five Shore Larks flew west by the Obs but, unfortunately, without stopping. Flocks of 20 Goldfinches and 18 Linnets wee also noted. Sunny and mild with a moderate southerly wind. Waders included a single Jack Snipe and Snipe flushed from the Marsh Pool, where there were also two Lapwings, and a Grey Plover on the beach. There were six Great Crested Grebes offshore and the immature drake Eider was still present. A Little Grebe found by Greg Herne in Coot Strait was only the second record for the year (the previous one, also along Coot Strait, was on 25th September). A Common Seal pup was apparently stranded on the sewage outfall pipe but disappeared when the tide came over it. On a brief afternoon visit, Andy scored with a Shore Lark, which appeared to get up from the eastern end of the beach, flying by him and continuing west. This species has been recorded here in eight of the last ten years. Sunny periods and showers with a light southerly wind. An owl circling over the tidal ponds harried by gulls did not seem quite right for Short-eared and Andy managed a few “shots” before it drifted off towards Hampton. These confirmed that it was indeed a Long-eared Owl – only our third recorded here and the first for over 20 years! There were 40 Mallard on the Marsh Pool and the immature drake Eider was still present offshore. Waders included 18 Redshanks on the beach and then on the marsh Pool. There was an increase in the numbers of Great Black-backed Gulls and 49 on the beach were almost all adults. Six Reed Buntings were feeding along the remnant brook. Sunny at times with a shower, light southerly wind. Three Red-throated Divers, a Great Northern Diver and six Great Crested Grebes offshore. Four Gannets flew east. A flock of 44 Mallard was unprecedented and probably relates to the flooding of the area due to heavy overnight rain. Waders included a single Golden Plover on the beach, a flock of 50 Lapwings heading west over the sea, eight Curlews heading SE towards the caravan park fields and 16 Redshanks on the Marsh Pool. Late morning, during a rain shower, another Swift sp appeared over the sewage works. It circled around a few times before drifting off south. 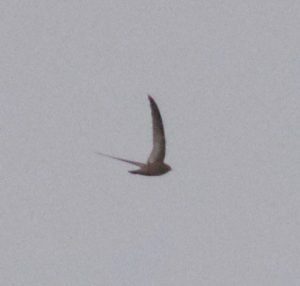 Andy managed to fire off a few shots which, on examination, showed the bird had features consistent with a Pallid Swift. As we are in an unprecedented “invasion” of this species along the East Coast, and the North Coast of Kent, this is not altogether surprising. After recent heavy rain, the brook has found its way to the sea again. Sunny and mild with a light southerly wind. There was one Red-throated Diver, eight Great Crested Grebes on the sea, eight Gannets flew east, one Wigeon flew west and the immature drake Eider was still offshore. A female Marsh Harrier came in off the sea and continued south at 10.40 am. Waders included 35 Oystercatchers on the beach, 15 Sanderlings and ten Redshanks. An adult Mediterranean Gull and 16 Great Black-backed Gulls were also on the beach. A Swift sp put in a frustratingly brief appearance above the sewage works and then drifted south. It looked pale, when it caught the sunlight, and given the time of the year and the weather conditions, Pallid was clearly a possibility. Also noted were a female Great Spotted Woodpecker and a single Siskin which flew west. Sunny with a moderate southerly wind. 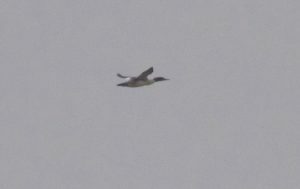 Our first Great Northern Diver of the winter and only our second Eider of the year (an immature drake) were offshore. The Eider was also joined briefly by two redhead Red-breasted Mergansers. Waders roosting on the shingle at high tide included 48 Ringed Plovers, 47 Dunlin and a single Sanderling. There were also ten Redshanks roosting on the Marsh Pool. Arnie noted a Sandwich Tern offshore. Arnie noted a Kingfisher and the pair of Stonechats. 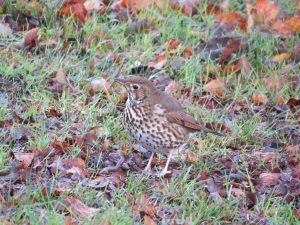 Whilst I was helping my wife to celebrate her birthday down in deepest Berkshire, Andy managed a few birds in the unseasonal, and unhelpful, mild weather. A Red-throated Diver, a Gannet and a Red-breasted Merganser, two Common Scoters flying east and four Great Crested Grebes on the sea. An adult Mediterranean Gull posed on one of the groynes whilst a few Skylarks passed overhead and a Chiffchaff and a Goldcrest were in the bushes. Sunny and warm with a light SE wind. A morning interrupted by the need for Andy, Ted and me to head east along the coast to see the spectacular, and first twitchable in Kent, White-billed Diver. Not a lot to see when we were here; a Red-throated Diver flew west and there were two Gannets offshore. 19 Brent Geese were on the Hampton flats, a Chiffchaff was at the Obs and a Brambling flew west in a flock of Chaffinches. A Red Admiral showed well by the changing rooms. A Velvet Scoter flew east with a flock of c50 Common Scoters. A Kingfisher was also noted. Sunny and warmer with a light SE wind. One Red-throated Diver, two Great Crested Grebes and three Red-breasted Mergansers flew west and a Canada Goose flew east over the Obs. 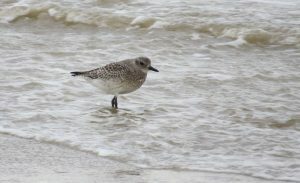 Waders included five Sanderlings and seven Dunlin on the beach. Three Grey Wagtails were chasing each other around Lang Court, two male Stonechats were in the grassland, one Redwing was in the churchyard and a Chiffchaff was at the Obs.